Those of us practicing a lifestyle focused on wellness aim to release our bodies’ natural vitality and glow by living in harmony with ourselves, others, and the earth. Yoga helps with this goal of supporting our natural beauty by improving digestion and circulation — helping all of our organs to work more efficiently. If you want to have healthy, glowing skin, then your diet, hydration, sleep, and skin care routines all need to work together to get the maximum benefit. In fact, we absorb so much of what we put on our skin, that whatever natural skin care products we use should really be good enough to eat. Acne comes in many shapes and forms, with some types being mild and non-inflammatory (whiteheads and blackheads) while other types can be inflammatory and even painful (papules, pustules, and cysts). Common causes include clogged pores, bacteria, hormone fluctuations, stress, lack of sleep, certain medications, poor diet, and other skin irritations. To treat acne naturally, use a gentle cleanser twice daily. Add a few drops of tea tree oil to fight pimple-causing bacteria, and some aloe vera to soothe inflamed skin. Follow with a natural toner. 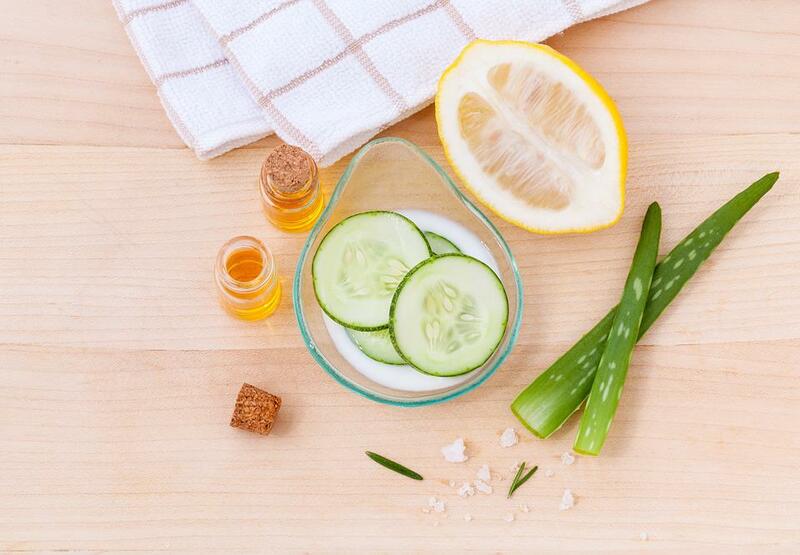 Complement this routine with regular, natural healing masks and gentle exfoliation. You can make a healing mask with yogurt, honey, cinnamon and essential oils, and exfoliate with sea salt, brown sugar, or ground oatmeal mixed with into a base of honey, kefir, or coconut oil. Even if you have oily or combination skin, remember to use a light, natural moisturizer daily. The term “eczema” refers to a group of skin disorders that cause dryness, redness, irritation, and scaling of the skin. Eczema is more common in children, but affects around 3% of adults. If you think you may have eczema, it’s important to see a doctor or specialist for an accurate diagnosis. To treat eczema naturally, start by identifying any allergies or skin irritants and get rid of them. These can include harsh, chemical products, dust, mold, pollen, animal hair, and some inflammatory ingredients found in processed and refined foods. Soothe itchy skin with a natural salve, or with a warm, moist towel rather than scratching. Follow an anti-inflammatory diet rich in essential fatty acids, fiber, antioxidants, and probiotic foods. Take immunity-boosting supplements rich in omega-3 fatty acids, probiotics, vitamins A, C, and E (antioxidants), as well as vitamin D3 (“the sunshine vitamin”). Finally, apply products containing healing essential oils, such as lavender and geranium. Other skin irritations are caused by fungi rather than bacteria. These include Athlete’s foot, jock itch, ringworm, meningitis, and candida, among others. Antifungal and antimicrobial essential oils are the most effective natural treatment for fungal skin conditions, and have been used in Chinese skin care creams for centuries. Oregano essential oil and tea tree oil are famous for their antibacterial properties, but be cautious of using these oils if pregnant or breastfeeding. Two of the best food-based antifungals are yogurt and garlic. A good probiotic yogurt and/or a probiotic supplement in your diet supports the multiplication of good bacteria, which fight the harmful, infection-causing bacteria. Garlic can be sliced and applied topically overnight for a few days up to a couple of weeks, depending on the location and severity of the fungal infection. Finally, stress, lack of sleep, and sun damage all take their toll on even the healthiest skin, creating lines, wrinkles, sun spots, and under-eye circles. Make sure to get enough sleep, drink plenty of water, practice relaxation techniques, and protect your skin from the sun to prevent premature aging. As part of your skin care routine, cleanse, tone, treat, and moisturize regularly with natural products that are rich in antioxidants and nourishing, natural ingredients. This daily bit of TLC will be well worth it when you notice your skin becoming smoother, softer, and more toned. Nature really has provided all we need for healthy, nourished skin. Providing food for your skin from within and without while living a mindful, balanced lifestyle is the best way to stay youthful and well for many years to come.